Corral (a.k.a Cave) is a loop puzzle originally published by Nikoli. To solve this puzzle, you must create a loop composed of vertical and horizontal segments with all the clues on the inside of the loop. Each clue indicates the total number of cells the clue can ‘see’ vertically and horizontally before running into an edge of the loop. (including the cell with the clue in it) The solution is unique. It can be useful to mark in some way which cells are inside and which cells are outside the loop. 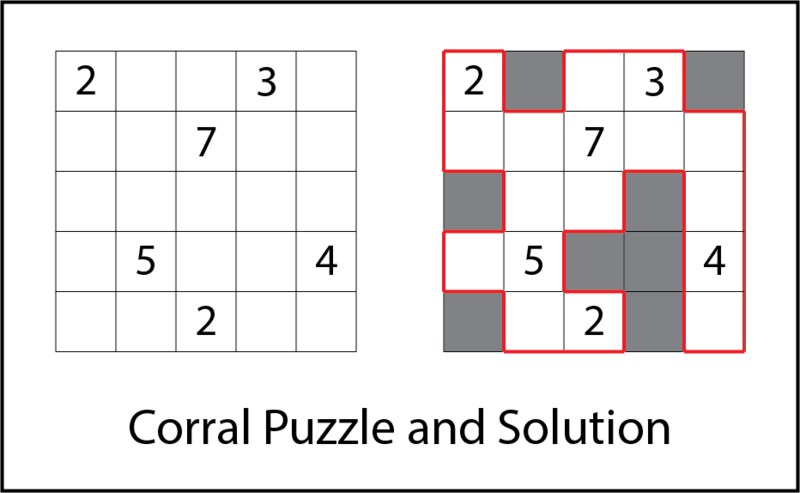 To further clarify the rules, below is an example Corral puzzle along with its only solution.